OS Map of Leighton Ultra route. Welcome to my page for the Leighton Ultra – a cross country looped trail starting and ending at the Grand Union Canal at Tesco’s Superstore in Leighton Buzzard. This is a 33 (ish) mile route starting from Tesco Superstore on Vimy Road in Leighton Buzzard. The route has a total ascent of 1674.0 ft and has a maximum elevation of 797.15 ft. Please park responsibly. Tesco Car park is 3 hours maximum. There is a multi story car park 10 minutes walk away from Tesco in the town centre. 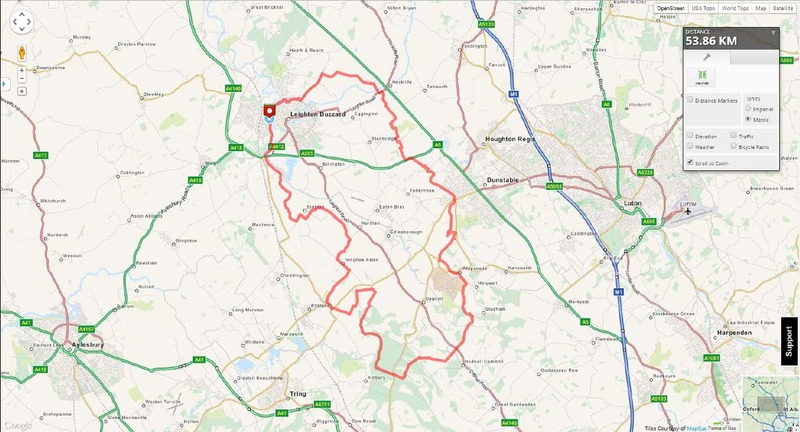 The route takes you through Hockliffe, Tilsworth, Sewell, Dunstable, Whipsnade, Little Gaddesden, Ashridge, Ivinghoe, Ivinghoe Aston, Northall, Slapton and then the Grand Union Canal back to Leighton Buzzard. Please use the contact form below to let me know if you would like to join in. No money is required as this is not an official or supported event. This is a social run/walk ultra. Below is the Map my Run route link for this route. Please use this if you would like to download the gpx for this route. For those of you who like a real map I’ve managed to put together a pdf with a map of the route in sections. Click on the link below to view and print. Below is a very rough route description. A lot of this is from memory and is probably missing some significant route landmarks. However, the whole route does follow public footpaths which can be followed on an ordnance survey map. The route may be updated closer to the event date. I will post an update here if there are any changes. The route description has been added to this page but it is sparse. The use of a map or gps device would be advisable if you intend to run the route at a quicker pace than myself. My pace will be ultra sloth – 12-20min miles depending on terrain. This is an unsupported event; there are 2 coffee shops and 6 pubs along the route. I will be running the course myself and sweeping. Please respect the countryside and other walkers on route. Please note – this is not an official event and does not have the same support, aid stations, first aid, insurance as with an official event. Please make sure you have money for a taxi to the start. If you have an emergency please contact the emergency services. Please carry appropriate clothing and supplies for an unsupported event. Thank you.